PLOT: Follows the passing of the FIFA baton through three association presidents: Jules Rimet, Joao Havelange, and Sepp Blatter. Having twice sat down to watch a movie to find that the opening 20 minutes are so bad I had to switch off (first was Theo & Chloe – a shoestring tale of an Inuit and a street girl that has ambitions far bigger than it’s talents, then there was Lost River, a film written and directed by one of my favourite actors and it seems least favourite directors), I had told myself that however bad United Passions was, I would stick with it to the end. Whilst the film is undeniably bad (monumentally so), I think my stubbornness to see it through to the end also softened my opinion of the movie resulting in a significantly higher score than you will find on IMDB and Rotten Tomatoes. The is billed as the story of the World Cup, but it is far more obviously a thinly veiled vanity project to tell the story of football’s world governing body FIFA and the film has courted a number of controversies. Not least was the decision of the federation to fund 90% of the £17m it cost to make, a figure much higher than the annual budget of many of the football federations it represents. Originally planned for release prior to the Brazil World cup in the summer of 2014, it was premiered at the Cannes film festival that year, but was only released in a handful of European countries and some of those were straight to DVD and it was even straight to TV in Italy. United Passions eventually got a release in the US in June of 2015, but this unfortunately coincided with the arrest of a number of high ranking FIFA officials on corruption and racketeering charges. It grossed less than $1000 dollars in it’s opening weekend. 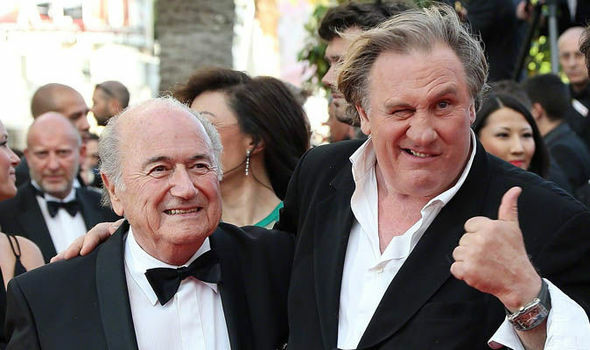 With a quite impressive cast the film concentrates on three men, Jules Rimet (Depardieu), Joao Havelange (Neill) and current FIFA president Sepp Blatter (Roth). It starts with a rather ludicrously overblown act regaling the creation of FIFA under the leadership of the blatant England hating Robert Guérin, after which it completely skips over the 12 reign of Englishman Daniel Burley Woolfall to get started proper with FIFA’s first superstar. Jules Rimet is depicted as a lovable visionary who single handedly created the World Cup, before showing us the first sign of corruption as Uruguay effectively buy themselves the vote to host the tournament. He continues at the helm for 33 years, despite his waning enthusiasm due to the in fighting and bureaucracy. When Rimet eventually passes the film ignores Rodolphe Seeldrayers (the Belgian who kept the president’s seat warm for a year) and the English six year president, Arthur Drewry. Stanley Rous took charge for the following 13 years and is not so lucky to be ignored, he is included for under five minutes as a raging, snobby racist with no redeeming features. Next up is Joao Havelange. Whilst Rimet was rotund, jovial and likeable, Havelange on the other hand is ruthless and apparently rather corrupt. Much of the dialogue presents him as a man only interested in money and being willing to bend and break the rules at will. His pursuit of money brings Sepp Blatter into the picture as he is hired to increase the coffers. He does so with a number of big name sponsorship deals. Havelange is almost always shown in a roof top pool, glamorous hotel or other such trapping of the high life. Blatter on the other hand is a scruffily suited hard worker with nothing more on his mind than developing the African game or promoting women’s football!! When Blatter eventually succeeds Havelange to the throne he has since refused to relinquish, rumours of scandal are rife. Havelange admits to Blatter that he has done some things that may be a tad ‘naughty’, but dependable Sepp refuses to dob him in, despite the impact it is having on his own profile. Instead, head held high he launches a tirade at the member federations declaring “this sport is spotless and any abuse of ethics will be severely punished,”. Of course the other members of FIFA are offended, complaining that the previous leader would never have treated them this way. But Blatter is the film’s hero and he will not back down, even at risk of losing the presidential election (which of course he miraculously did not lose). Beyond the halo above Sepp’s head and the depiction of FIFA as a footballing family, there are two over-riding themes that come through in United Passions and neither are positive. The first is an overwhelming hatred of the English. I promise to you that this isn’t a sore Englishman complaining over nothing, the film presents every single Englishman as the worst kind of racist, sexist and elitist caricature. It really does have to be seen to believe that the script was accepted and that the English actors accepted the roles. The other message that we are bombarded with comes from the many cut-scenes throughout the story. A dust and gravel pitch, presumably in a poor South American country, plays host to a large group on children and youths playing football. We see many races, sizes, skill levels and even one girl. However throughout most of these asides the sullen ginger girl is useless. She is stuck in the goals and fails to get anywhere near the ball when even the softest of shots comes towards her. But then, just before the credits roll, with the ball in her hands, looking across the field for someone to throw the ball to, something magical happens. Little orphan Annie drops the ball to the ground, runs with it performing step overs and tricks as she goes. She passes one, two, six players and eventually slots the ball perfectly home. The whole pitch goes wild, she is lifted on to the shoulders of her adoring fans and it is all over. A positive image of a girl being as good, better even than the boys? Or a patronising show that girls are not equal in football and that if a girl should ever score a goal against boys then all football is over, the game is won, we need never play again. A girl scoring a goal is like the Golden Snitch in Quidditch, 100 points to the scoring team and the final whistle, a six and you’re out at street cricket. I am sure there is something noble behind the heavily applied propaganda, surely such a fine cast would never have taken part otherwise. 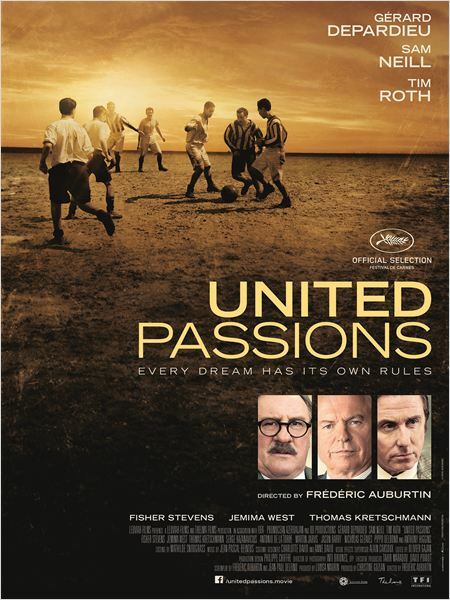 But United Passions is the epitome of what FIFA means to most around the world. An over aggrandised, self love affair that besmirches the history of the beautiful game with its corrupt practices and inexplicable hero worship. BUT, I hate to say that I still somewhat enjoyed the film. It is for the most part shot reasonably well, the acting is usually OK and the story is slightly interesting (whether you choose to believe it or not). It isn’t exactly the highest praise, but I rather watch this again than Spy, Ted 2 or Jersey Boys. United Passions is the epitome of what FIFA means today. An over aggrandised and delusional self love affair with no sight of the real world.